Are there any good quiet blenders on the market ? As the speed and power of blenders has increased over the years, many people are having a hard time finding a quiet blender. Noise definitely is a concern if you live in an apartment or make smoothies early in the morning before others are awake. The two main ways that blender manufacturers will reduce noise is by either dampening the sound coming from motor housing or sealing the blender jar in a plastic enclosure or do both. If you want a quiet high-powered blender then you will find that the “Quiet” models are designed similar to the commercial blender lines to meet the low-noise requests from restaurant owners. Fortunately, there are some excellent blender models that provide good performance with reduced noise. 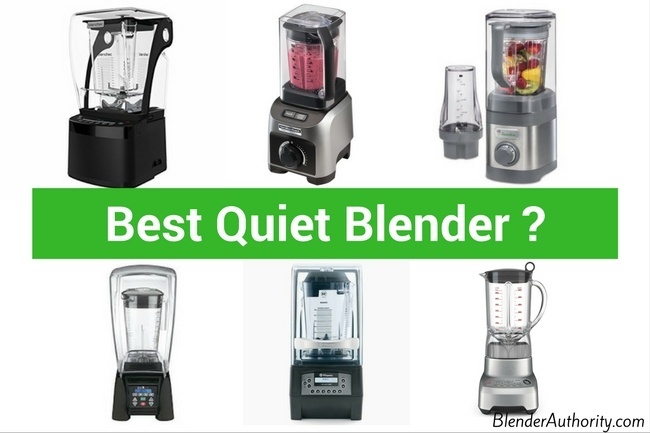 In this guide, I will help you find the quietest blender for your needs. While most people are familiar with the Jamba Juice smoothie store chain, you might not realize that they now offer a series of blenders for the home. The Jamba Quiet Blend blender is designed with a unique enclosure that sits over the blender jar to help reduce noise. It comes with 1.6 horsepower motor which is enough for blending smoothies and will meet most consumer’s blending needs. The Jamba Quiet includes both a 32oz blending jar and a personal size 20oz jar with blade. 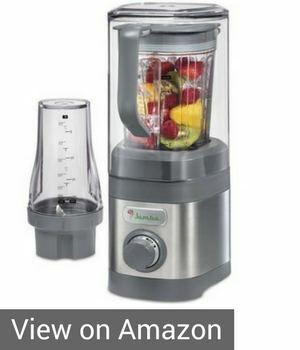 It offers a 5 year limited warranty which is more than many blender brands offer in this price range. For controls, I really like the variable speed control dial which isn’t always available on blenders at this price range. Having the variable speed dial allows you to easily adjust to the type of ingredients you are blending so you don’t over-blend ingredients. Positives: Very quiet design and excellent customer feedback. Blends quite well and offers nice power, blending controls, and accessories for the price. The 1.6 HP motor is plenty of power for making smoothies and basic blending tasks. I like how this blender offers the separate blade with the 20oz jar for small blending jobs such as blending nuts or personal smoothies. For noise, it definitely is quieter than most blenders. While not an exact science, I read that that the Jamba Quiet Shield Blender runs about 40% quieter than a typical blender. Negatives: It doesn’t offer the versatility and blending power of other high powered blenders like Vitamix or Blendtec but for smoothies the Jamba Quiet Shield is excellent. The other negative is that the 32oz Jar might be a little small for some people compared to full-size high speed countertop blenders which can have jars that are twice the size. Overall Opinion: The Jamba Quiet blender is a great blender for performance and sound at this price range which makes it my top value pick. A great choice for dorm rooms or small spaces where blending noise is a concern. Consumers love it and it has strong reviews. If you just want a quiet blender that is relatively compact in size and provides nice power for making smoothies then the Jamba is a great choice. It really is quiet and well priced for what it offers. The Blendtec name is known for its high-quality blenders and they are widely used in smoothie shops around the world. The Pro 800 Model is marketed as the “World’s Quietest Blender” because it is over 80% quieter than typical blenders. The Pro 800 is designed for the consumer home market but offers many of the features of its professional commercial blenders. The Pro 800 model is modeled after their popular “Stealth 875” commercial blender in that it uses the same Stealth noise dampening features and same amazing performance for a home blender. The Blendtec features a very powerful 3.8 HP motor(1800 watt) motor which is more powerful than its popular “Classic Series” home models. The controls on the Pro 800 models are similar to Blendtec’s Designer series with its popular digital touchscreen slider control which offers 11 different speeds and 6 pre-programmed functions. The key sound features on the Blendtec Professional 800 are the sealed enclosure that goes about the blender jar and the sound dampening design on the motor base. The Professional 800 blender uses Blendtec’s most popular jar called the “Wildside Jar” which hold 96 fluid ounces and uses a longer 4 inch blade for improved blending capability. Blendtec’s patented Wildside jar design has won rave reviews for its ability to evenly blend smoothies. Positives: The Blendtec Professional 800 provides amazing, high-end blender performance with very low noise. It provides the same performance and features as Blendtec’s commercial blender models that you see in smoothie shops like Jamba Juice. Also, the Blendtec 800 Pro comes with an industry leading 10-year full warranty so you can feel comfortable knowing that you are buying a reliable blender. The Pro 800 is Blendtec’s largest residential blender but still will fit underneath a standard kitchen cabinet height. Negatives: Honestly, the only negative for the Blendtec Professional 800 is the price for some consumers. Although, you truly get what you pay for with this blender if you are seeking performance and quiet. Overall Opinion: The Blendtec Pro 800 is the best quiet smoothie blender on the market for home use. When it comes to high end blenders, you will usually see a comparison between the Vitamix vs Blendtec as they are considered the two top consumer blender brands. Both brands are excellent but the Blendtec Pro 800 is hard to beat for its low noise and amazing 10 year warranty versus Vitamix Quiet one is intended for commercial use so it has a 3 year warranty. Also the Blendtec Pro 800 digital controls are pretty cool. If you can’t afford the Pro 800 then take a look at the Jamba Quiet Shield blender that I reviewed above. See our Blendtec Pro 800 Review for more details. First off, let me say that the Vitamix Quiet One (Model 15-0469) is not cheap, but it is an excellent option if you want a reliable, quiet commercial quality blender. You will see that the commercial blenders used in many smoothie shops and restaurants are enclosed in a plastic case like the Vitamix Quiet One blender. The “Quiet One” sound enclosure is held in place by magnets to create a good seal and is very simple to remove for cleaning. This model does not look like the typical Vitamix home blenders and is meant to stay on the counter since it weighs in at a heavy 27 pounds. Positives: If you want a commercial-quality blender that is quiet then this is a good choice. I love the Vitamix brand and this blender can blend anything. The noise from the Vitamix Quiet One is noticeably quieter than typical high speed blenders but the Blendtec 800 model I discussed above is quieter. 1. 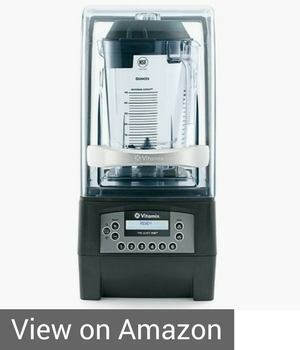 Price: It is 2x the price of other Vitamix blenders because it is part of the commercial line. Overall Opinion: While Vitamix Quiet One is an excellent blender for performance and noise reduction, I have a hard time justifying the price and shorter warranty when compared to the Blendtec Pro 800. Also, it is heavier than other blender so if you want a blender that is easy to move and store then the Vitamix Quiet One is not the best choice for you. For commercial use though the Vitamix Quiet One is a top choice. The following blenders are quiet relative to most blenders but they didn’t quite make the list of the best quiet blenders for reasons mentioned below. They might still be worth considering if you have specific budget or blender needs. Hamilton beach really does offer good blender for the price but the Quiet Shield I feel is still noisy relative to the other blenders I listed above. For example, skip to the 2:13 mark in the video below to see the noise of the Hamilton Beach Quiet shield. Hamilton Beach Quiet shield provides an excellent 1500 watts / 2 peak HP motor and 32oz Jar. I like the controls with the 4 program settings with variable speed dial. Overall, the Hamilton Beach Quiet shield offers similar performance, features, and price as the Jamba Quiet Shield blender but I would choose the Jamba Quiet blender as it is quieter. (Note- There is also the Hamilton Beach HBH850 blender which is a commercial-level blender with noise dampening container, but I didn’t mention it in this article because it is expensive and more than what a typical consumer needs. 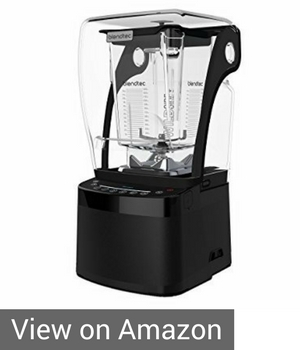 At this price range, I prefer the Blendtec or Vitamix models mentioned above. The Waring Commercial MXX1500XTX is a serious high powered blender that comes with a sound enclosure for sound dampening. It is designed for the commercial blender market with a 3.5 peak horsepower motor which is probably more than the typical consumer needs at home. Watch the video below to see it in action. I didn’t include this blender in my list of top quiet blenders simply because it isn’t as quiet as my top choices. Also, for this price I would expect more that the 2 year parts and labor warranty that it provides but that is pretty common for the commercial blender market. Waring is a reputable, reliable blender brand and this specific blender model has been on the market for almost 10 years but there aren’t a lot of consumer reviews because it is oriented for the commercial market. Overall, the Waring MX1500XTX is a very powerful blender and might be even more power than most consumer’s needs. It is priced in between the other blender models list above so it might be worth consideration if you really need the power, but I felt the Jamba blender or the Blendtec 800 were better choices for noise and price. The Breville Hemisphere is an excellent blender and while it doesn’t have a sound enclosure like the above blenders, its design allows it to naturally be quieter than most blenders. This Breville blender was one my top choices for best blenders under $200 as it has excellent reviews from independent industry testers and consumers. For more details on the blender read the review at the link above. All the blenders in this article are good blenders but if sound, performance, features, and price are the deciding factors then I would go with the Jamba Quiet Shield blender for value (or similar Weston model if the Jamba is out of stock) value or the Blentec Pro 800. Both models are excellent choices if you just want a quiet blender for smoothies. You didnt list the Breville model. They make many models with the Hemisphere name that look similar. Or does your review cover the whole hemisphere line? Hi Kyle, the Breville model we mentioned is the Breville 605XL (its probably the most popular Breville Hemisphere model) but it wasn’t one of favorites if you are focused on finding a quiet blender. Here is a link to review of the Breville blender. It is a good blender. Nice article but… Any smartphone with a Noise meter app would have give us a true comparison of the noise levels. Thanks for posting this article…and including the Jamba blender…seems like a shoe-in for simple single glass smoothie makers like me (who don’t want to wake the neighbors in the morning ). I couldn’t find the Jamba available online, but figured it was just a re-branded Weston 58918…so I just ordered that. Note — Jamba replacement parts are ordered from Hamilton Beach…and Weston was bought by Hamilton Beach a few years back…so pretty sure it is the same device except for colors/badges. Hi Carlos, yes they do look identical. I know that Hamilton Beach built the Jamba blender line and Weston is a separate division but they do look identical and probably a good bet. It does seem like the Jamba Quiet blender isn’t easily available anymore. Received the Weston 58918 and does a great (and quiet) job for my simple early morning smoothies…I didn’t even need to go to the max (loudest) blend speed to get the desired consistency. It does a way better job than my older Breville hemisphere with regards to spinach leaves. I had picked up a VitaMix previously and returned it after spending too much time looking for ways to dampen the noise (here is a link to dampen the noise for those who do more things which require the 1100W – 1500W blenders whisperblend.com. On the Jamba site — the Jamba machine is listed as a Model 58915 — similar model naming convention as Weston (58918). Likewise the “Jamba Professional” is listed as model 58910 which is rather similar (appearance/specs) to the Weston 58914. Thanks again for the great product recommendation — the Jamba/Weston fit my requirements exactly. Hello Carlos, thanks for the feedback. We updated our review above to include the Weston. We spoke to representatives at both Weston and Hamilton Beach. Both confirmed they believed that the Weston 58919 and Jamba 58916 seemed identical but they couldn’t confirm that the internal builds were the same(although they suspect that they are based on the specification of each model and because they are made by the same manufacturer).